incorporate the concept of SVM in your project. I'll be posting other tutorials/progarms using LibSVM here. SVM's are used for classifying data in 1 or multiple dimensions into 2 or more classes. All they do is try to clearly separate two classes from each other in clustering. They work on labelled data (for unlabelled data, you will need a ground truth to establish the accuracy of the SVM). I would actually recommend you to read LIBSVM documentation completely (as it is less than 16 pages). After reading that you can get some insight into what libsvm is about and how you can use it in your project. Basically a SVM takes in a set of feature vectors (value in multiple dimensions) while training and outputs the labels in testing phase (and given labelled test data, we can measure the accuracy on how to better differentiate the classes). If we were to differentiate a square from a rectangle. We have 2 dimension feature vector i.e. length, width. The following logic defines our feature vector and thus our SVM. I guess you must have figured out what 1 and -1 meant. In above data 1st column deals with the label (i.e square or rectangle. Square=1 and Rectangle=-1). The 2nd and 3rd column deals with length and width. 1: and 2: tell libsvm that they are 1st and 2nd dimension of data respectively. You can have the above data in different ways. If you were have series of images as input. Depending on size and colorspace, you will have different input feature vector for each image. Here 1 and -1 represents the class label (defined according to you). Each row represents an image. Now lets download libsvm and get started. I would also suggest you to install python. If you are on Linux, click here to download the tar ball. Then give the command tar xvzf <libsvmsource.tar.gz> , where <libsvmsource.tar.gz> is the tar ball that you downloaded. It would be unzipped into a folder. Also install GNUPLOT ( $sudo apt-get install gnuplot ) on your system. Now as we have downloaded and installed LIBSVM, lets try to do a simple classification in LIBSVM. Download the testing data and training data and put them in a folder. 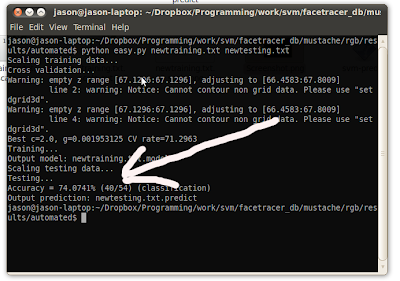 In the downloaded data, newtraining.txt represents the training data and newtesting.txt represents the testing data. Copy the svm-predict, svm-train, easy.py, grid.py from the folder where you installed libsvm to a folder where you have testing and training data saved. Executing above command will output on how much accurate the training was. outputlabels.txt is a text file that stores the respective output labels for the input feature vectors in <testing_data> file. Executing above command will show the accuracy of the generated model (by libsvm). If you observe the above procedure yeilds a accuracy of 51.85%. This is considered to be low for a SVM. This is so because we need to scale paramaters, select best SVM kernel type for the given input data. In order to do so, we use the automatic way of using LIBSVM. Jump to the next part. Basically its the code which is pointing to svmtrain, svmpredict, etc executables. 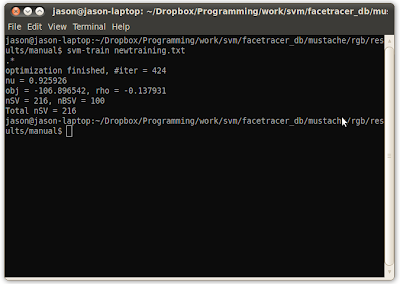 Edit the above to point to the svmtrain, svmpredict, etc executables. Here <training_data> and <testing_data> refers to the training and testing files. The above command automatically scales the data (you should know what scaling is if you've read libsvm documentation). The above command automatically scales data, does cross-validation, selects optimal kernel for the SVM automatically without you having worry about the training and testing parameters to generate a reliable SVM. 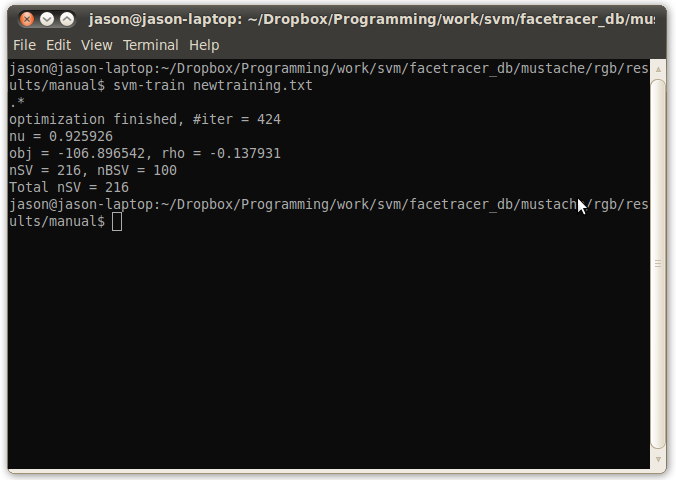 The output on the terminal/command prompt shows the accuracy of the SVM. Also in the present folder are the files which have output labels of predicted data. Using the automatic way, we get an accuracy of 74%. The automatic way is the best way to use LIBSVM as it does cross validation, selects best svm kernel type, scales the test and training data. Is there an easy.py equivalent tool or utility developed in Java to work with Java version of LibSVM? I dont think so. But easy.py uses the executables of svm-scale, svm-train, svm-test which are written in C.
All I can suggest is, go through the easy.py code and change the above executables to java classes of the same i.e. svm-test.class, svm-train.class, svm-scale.class and they should work (theoretically). The above suggested solution might just work. Otherwise, you can go through the source-code, see what it does (scales the training, testing data, gives them to grid.py to estimate best training parameters, train and then test) and do the same in java. For unlabelled data, how to classify ? @above: Please be more clear in your question. If you are dealing solving a machine learning problem with unlabelled data, then it would be unsupervised learning problem. If you are dealing with unlabelled data in testing phase, read this article carefully it has the answer. i have data format like ,time, iperf(internet performance),thruput min,thruputmax,..
how to identify the class label and conversion of the format..
you need to know class label before hand in order to use an SVM. Please read basic pattern recognition and machine learning. and how can i manually decide these parameters...??? Easy.py takes care of most of the stuff. Run that on the data and it will generate the appropriate parameters (available in the model files created). Go with a trial and error strategy to guess the parameters. I will suggest you to use scikit-learn toolkit in python. With it, you could manually try out kernel type, c, gamma values and look at the results. i want to apply svm to annotate images how to do that? put your data files where there is easy.py installed. The data should be in given order. @Ellian Laura: You should set the System Variables. Go to My Computer -> System Properties -> Advanced -> System Variables -> System Variables. In system variables, edit "Path" variable and add "C:\Python27\;" in the end of the text and save it. Close everything. Then open "CMD" from Windows->Run. If you can "python" command successfully, you have correctly set the path. @Rishan: Read the article and use the technique mentioned above. Instead of the feature vectors mentioned above, use your own feature vectors. They will be of size 30 x 30 = 900 length. 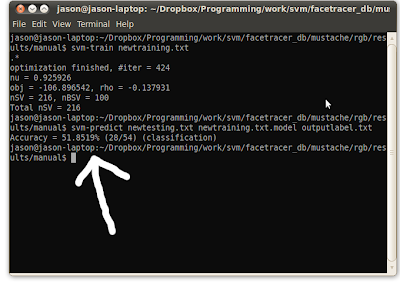 Separate training and testing feature vectors.